In a society dominated by crime, at home or at business, it has never been more important to implement measures to secure the safety of valuable belongings and loved ones. It can be argued that the simple lock and key is no longer equipped to provide this vital security. Access control is an updated and effective method of ensuring that access to a business system, certain areas of a premises or physical and virtual resources are restricted, either by an authority or a business. There are two different types of access control: physical control, which restricts access to physical things such as buildings, campuses and rooms, and logistical access, which limits access to connections such as computer connections, data and system files. There are also different types of control practices, the most secure of which entails a two-factor authentication. Firstly, credentials must be presented by the person requiring access. Thereafter, his/her identity must be corroborated. It can be done by way of an access code, a PIN or biometric reading through a biometric reader. In big companies and buildings, intruders sometimes go unnoticed rather easily, especially because they can appear in all sorts of forms: staff or visitors. It is for this reason that access control systems can come to be such an advantage to companies – it doesn’t only detect intrusion, it has the ability to prevent it and track movement in a building by monitoring who has access to that building. Access control systems can be customised to each individual’s specific needs. After optimised as such, it is possible to control who uses what doors within a business, what time of the day or which day of the week the doors are used. Customising external and internal doors as such ensures that employees or visitors are only accessing doors, rooms and areas which they require and gives a business considerable regulation over the foot flow within the building. It also works well to monitor whether employees are actually present at work at all. Whether at home or at a business, everyone has valuable equipment and belongings that need to be kept safely. Having access control in place can ensure exactly that, as it limits who has access to those belongings, and restricts access to certain areas of a business or residence where valuables are stored. To companies that work with hazardous equipment, access control is crucial, since industrial accidents should be avoided at all cost. A system is required which effectively ensures that unwanted and unauthorised personnel do not have access to the premises. As a company or building owner, one is faced with the continuous struggle concerning crime. This includes vandalism, theft, burglary, and even arson – all which can be averted using the proper precautionary methods. With an access control system, it is possible to monitor who has access to a business and which areas they have access to.. Such a system can also effectively detect and prevent criminal activity. CCTV cameras can be installed, any high risk or stock areas can be restricted to authorised personnel only using the two-factor authentication control system. With the knowledge and control of who has access to a building, when and exactly where, employers are able to increase the safety of their employees. Providing a safe working environment is vital to the continued success of any company. With access control systems in place, it is possible to log and record every time access is granted to a property. These reports can accurately detail time and place of access for reviewing purposes if necessary or required at a later stage. For security purposes, it provides the owner of the premises with peace of mind, and the company owner has an audit trail that can be accessed electronically at any time. Securing a premises with the straight forward lock and key is well, simple and sometimes even very effective. But what happens when keys are lost or the company is running on a large scale operation? The prospective cost of replacing locks or having to cut new keys can come to be rather costly. Keys can also be risky as they have the potential to be copied. None of these issues or inconveniences come to light with an access control system. It is not only modern and state of the art, but it is also considered to be the most successful, efficient and practicable security methods. Access control systems don’t only allow you to protect your building, your valuables and your staff, but also your environment through the reduction of energy used in companies. As it is always aware of the areas being occupied, it is able to automatically turn off unused and therefore unnecessary lightning, thereby decreasing heat and electricity bills, saving companies a lot of money. For securing a premises, giving staff access to certain areas thereof or merely giving employees access to the building between nine and five, access control systems can do it all. It is an updated, effective and easy way of providing the best security for loved ones and precious assets. Why risk it when it can be prevented? 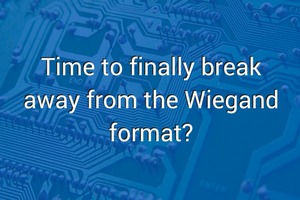 Time to finally break away from the Wiegand format? 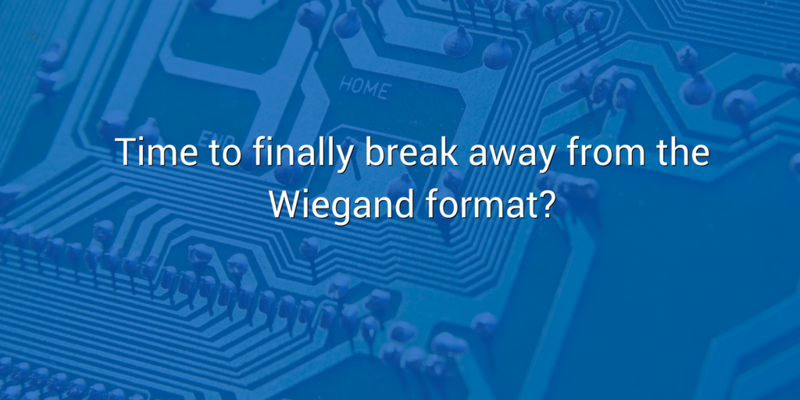 The Wiegand interface, which rose to popularity in the 1980s, has long been accepted by the access control industry as the de facto wiring standard for interfacing between access controllers and various card or biometric readers. As usual, the longer a technology is around, the more methods of exploiting its flaws will be found. Wiegand devices by their very nature tend to be unsupervised devices which can mean that they are the perfect attack targets for entry into secure areas – be it parliamentary buildings, airports, schools or other highly sensitive points. The devices that are used for identifying the person attempting to attain access vary from extremely advanced (and expensive) retina, fingerprint or facial scanners through to proximity cards wielding the latest in secure storage and encrypted communication protocols. This information is then sent across insecure wires to a controller that also communicates using the latest in security. Micro sensors that are put in place to ensure that the devices are not tampered with are ironically often disabled to make for easier servicing, do not have any method of feeding the alarm state back to a security centre, or only disable the device itself when active. A Google search for the term ‘Hacking Wiegand Protocol’ will reveal many attacks that can be used against access control systems that employ this wiring system, including man-in-the-middle attacks whereby the CEO’s access control identification can be captured and replayed at a later point – this using a bottom-of-the-line and cheapest microcontroller with some fairly simple firmware. There are various other issues that present themselves; including wiring length, number of wiring cores required to service the full interface, lack of encryption, overlap of card numbers and mostly unidirectional capabilities. The access controllers or devices that use this wiring standard are not to blame for the on-going use and proliferation of this protocol as it has been used in the industry for so long that it has become ‘part of the furniture’ and accepted as the most common method for interconnectivity. Tackling all of these challenges and allowing different devices and systems to communicate with each other seamlessly is a fairly complex task which has been taken on by the Security Industry Association (SIA). The protocol that has emerged is called OSDP (Open Supervised Device Protocol). OSDP has been developed to communicate over two data lines and one earth line which makes it the perfect fit for RS-485 multi-drop communications, however it can also be extended to communicate over TCP/IP. Encryption has been built into the protocol, along with checksums for ensuring data integrity and monitoring capabilities to be able to tell when a device is damaged, offline or being tampered with. As the access control industry starts to implement this protocol and the standard becomes more accepted there will be more and more devices that support OSDP and less that will implement Wiegand. 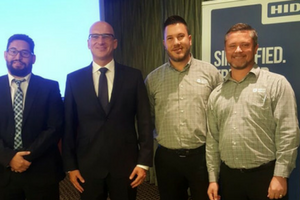 As a company, Saflec Systems has decided to start the migration process and has partnered with a number of companies, including Virdi (a popular biometrics provider) and HID to ensure that its solution is on the forefront of this OSDP revolution. The new SDC-6xx controller range will support the OSDP protocol, and the new display reader soon to be released will also incorporate the protocol. As the popular idiom goes – “a chain is only as strong as its weakest link”. It’s time to stop relying on this particular link.